If you’ve been craving some Duke Silver in your life, oh, do we have news for you. The trailer for Nick Offerman’s Hearts Beat Loud is here, and it has Nick Offerman playing music for days. Oh, and he has a beard. Just prepare yourself. Hearts Beat Loud shows Nick Offerman as a music-loving single father to Kiersey Clemons, a serious future premed student. When Offerman’s character, Frank, is forced to close his enormous record store due to skyrocketing rents, he looks for more ways to spend time with his daughter. His daughter, a college-bound senior in high school, doesn’t really have time for his foolishness. But Frank encourages her, and the two eventually write a song together in their incredible loft. Spoiler alert: People dig it. Hearts Beat Loud will definitely make you cry. At the very least, it will make you want to call your parents! It hits every *possible* note, and that’s just in this trailer. Single parenthood? Check. Loss of a parent? Absolutely. Potentially queer storyline between Clemons and a character played by Sasha Lane? You know it. Honestly, it’s like a movie that was dreamed up in a Tumblr lab, and we can’t wait. 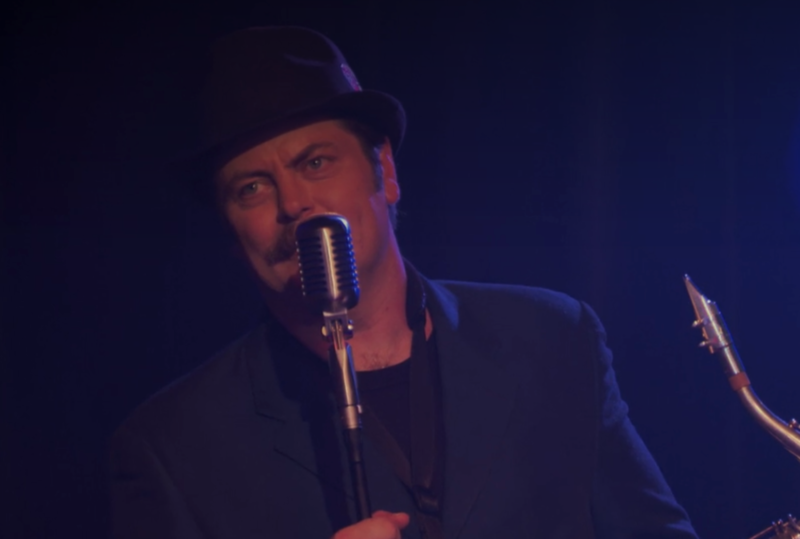 Fans of Parks & Recreation know that this isn’t the first time Nick Offerman has picked up an instrument on screen. Series creator Mike Schur wrote that storyline for Offerman before discovering that the actor had played saxophone for most of his life. Incredible. Offerman’s other hobbies include woodworking, carpentry, and performing musical comedy routines with his wife Megan Mullally. In short, he is so perfect. So, so perfect. Hearts Beat Loud also stars Toni Collette, Blythe Danner, and legit music performed by Nick Offerman and the adorable Kiersey Clemons. It’s in limited release on June 8th.